The city of Jerusalem was founded during the second millennium B.C., and the construction of the first Jewish temple in about 1000 B.C. established it as a holy city. Since that time, Jews have regarded it as their political, religious and spiritual capital although they have not always held control. In 586 B.C., the Babylonians conquered Jerusalem, sent the Jews into exile and destroyed their temple, but a few decades later, the Jews were able to return and build a second temple. In the centuries that followed, Greeks, Egyptians, Syrians and Romans controlled Jerusalem, with a period of Jewish rule around the turn of the millennium. The Jewish population grew in strength and maintained freedom of religious practice in Jerusalem until about 70 A.D., when the Romans destroyed the city and the temple, which was never rebuilt. The years preceding the destruction of the second temple marked one of the most influential events in world history: the birth, ministry and death of Jesus of Nazareth. A Jewish teacher who advocated reform within Judaism and who many regarded as a healer or prophet, Jesus was executed by the Roman authorities in Jerusalem, according to Biblical accounts. His teaching, and the circumstances of his life and death, subsequently spawned the world’s largest religion, Christianity. The formation of Christianity would have great effect on the rule of Jerusalem, for in the early fourth century Constantine became emperor of the Roman Empire and converted to Christianity. Whereas under pagan Roman rule, Christians — as well as Jews — in Jerusalem had been persecuted, Constantine issued an edict granting religious freedom to all Christians in his domain. Christianity ultimately became the official religion of the Roman Empire. With Constantine’s changes came a tremendous surge of Christian building activity in Jerusalem, including the construction of churches to memorialize events in the life and death of Jesus. Within Christian-dominated Jerusalem, however, there was little tolerance for the Jewish faith. In the early seventh century, Muhammad Ibn Abdallah inspired what was to become the world’s second-largest faith, Islam. Muhammad’s teaching, which began in Arabia, spread throughout the Middle East at a phenomenal rate. In 638, Muslims captured Jerusalem and began a 450-year rule. Islam arguably had a greater effect on Jerusalem than Christianity. Jerusalem’s Christian rulers had abandoned the area of the Jewish temple, whose destruction they saw as proof of God’s abandonment of Judaism and establishment of a new covenant under Christianity. The Muslims, however, recognized the sacred nature of the place and began erecting mosques and monuments, including the Dome of the Rock, the first great Muslim shrine. Further, under Muslim rule, Jews were once again permitted to live in the city and to establish places of worship at its holy sites, and Christians were also granted religious freedom. Jews and Christians, however, were not legally considered equals of Muslims, and the co-existence of the three religions of Abraham was not always easy. At various times members of each group suffered persecution and the destruction of their places of worship. In 1071, Jerusalem came under Turkish control, and the destruction of the city and persecution of Christians prompted the Pope to call for a holy war for the control of Jerusalem. Less than 30 years later, Christian Crusaders took control of Jerusalem and slaughtered the city’s Muslims and Jews, but their reign was short lived as Muslims retook the city in 1187. In 1517, the Turks conquered Jerusalem, which remained a part of the Ottoman Empire for 400 years. In this era were mixed periods of friendly and ill relations among the three religions, but sectarian strife increased, especially during the 19th century. After World War I, the British gained control of Palestine, including Jerusalem, and endorsed the idea of a national home for the Jews. This idea had developed toward the end of the 19th century, when European Jews began establishing colonies amid Palestine’s Arab and Muslim communities, and the Jewish population grew to become the majority in Jerusalem. After World War II, the catastrophe of the Holocaust increased international sympathy for the Jewish cause. In 1947, the United Nations resolved to partition Palestine into Arab and Jewish states, with Jerusalem designated as an international city. Bordering Arab nations resisted the establishment of Israel as an independent state and a war for Israel’s independence broke out in 1948. Following the 1948 war and the British departure from Palestine, an armistice agreement between Israel and Jordan divided Jerusalem between the two countries, in defiance of the U.N. partition resolution on Palestine (Resolution 181) and the international community. With Jordan in control of East Jerusalem — where sacred sites including the Temple Mount are located — Jews were denied access to their holy sites and Christians were subject to restrictions as well. In 1967, Israel seized the remainder of Jerusalem but restored access to sacred sites for all religions. In the decades since, Palestinian Arabs, most of whom are Muslim, have struggled to achieve their own statehood, which some feel should include all or part of Jerusalem, especially the sacred sites that crown the Temple Mount: the Dome of the Rock and Al Aqsa mosque. Judaism was the world’s first monotheistic religion. In a world in which cultures revered different gods for different attributes or powers, the notion of one all-encompassing God was revolutionary. In addition, this single omnipotent God was loving, just and merciful, unlike the pagan gods of the time, who often behaved no better than humans. The Jews believed they had been specially chosen by God to receive his guidance and be an example of his power in the world. The first five books of the Bible, called the Torah, tell the story of the birth of Judaism and the Jewish people including Abraham, the father of the faith, and Moses, through whom God gave his people a set of rules to live by, which include the Ten Commandments. For Jews, Jerusalem was the foundation and center of the world, and the place of God’s abode on Earth. The temple in Jerusalem was central to their faith and practice. It was believed to be the site of the altar where Abraham prepared to sacrifice his son Isaac as an act of obedience to God; it housed the Ark of the Covenant, where the stone tablets of the Ten Commandments were held; and its inner sanctum was the earthly home of the divine presence of God. After the destruction of the temple, the practice of Judaism was no longer dependent on the temple and it became a faith that could be practiced anywhere in the world; however, the hope of rebuilding the temple in Jerusalem remains a key element of Jewish belief. Christians also believe in one God — the God of Abraham — and the history contained in the Jewish Bible, which became the Old Testament of the Christian Bible. The faith was founded by Jesus’ followers, who believed he was the son of God and that his life and death were the fulfillment of prophecies from the Old Testament. Most Christians believe that after Jesus’ crucifixion and burial in Jerusalem, he rose from the dead, evidence of his divine nature. The faith is centered on the teachings of Jesus and of the Christian churches that developed after his death. Christians revere Jerusalem both because it is the place of Jesus’ death and resurrection and because of its importance to the Jews, their spiritual predecessors. Some also hope for the rebuilding of the Jewish temple, as they believe it will hasten the return, or “second coming,” of Jesus. Islam is also based upon the belief in one God who is just and merciful. The faith was founded on the teachings of Muhammad, who for 22 years, beginning in 610, received revelations believed to be from God. His followers compiled these revelations in the Muslim holy book, the Quran. Muhammad taught that Allah (God) was the same as the God of the Jews and Christians. Muslims believe that their faith has always existed, that it was gradually revealed through earlier prophets — including Abraham, Moses and Jesus — and was fully made known through Muhammad, the final prophet. Islam means “submission to Allah,” which is the basic tenet of the faith. Muhammad advocated a return to the original religion of Abraham, who lived before the Torah or the gospel and thus practiced a faith dedicated to God alone rather than creed. In the first century of Islam, Jerusalem was regarded as one of the most sacred places on Earth. Today it is Islam’s third-holiest city after Mecca, where Muhammad founded the faith, and Medina, the site of Muhammad’s tomb, in Saudi Arabia. The Temple Mount is an enclosed platform at the top of Mount Moriah in East Jerusalem. It is regarded as the location of the first and second temples and is the center of Jewish sacred history. The Western Wall of the Temple Mount, the only remaining portion of the temple, is the most sacred Jewish site in existence today. The faithful come to pray at the massive wall of white stones, 534 yards long and 60 yards high. Often prayers are written on small slips of paper and inserted in the cracks between the stones. Another important site is the cemetery on the Mount of Olives, the largest Jewish cemetery in Israel, and for Jews, the holiest one in the world. The Temple Mount, known in Arabic as Haram as-Sharif, or the Noble Sanctuary, is also the sacred center of Islamic Jerusalem. The 35-acre plaza contains two ancient mosques, the Dome of the Rock and the Al Aqsa mosque. The Dome of the Rock, built in the late seventh century, enshrines a large stone from which Muslims believe the prophet Mohammed ascended in a night’s journey to heaven, where he encountered the earlier prophets. Because Muslims trace their roots back to Abraham, they also revere the rock as the place Abraham offered to sacrifice his son and as the site of the Jewish temple’s innermost shrine (the Holy of Holies), the home of God’s divine presence on Earth. 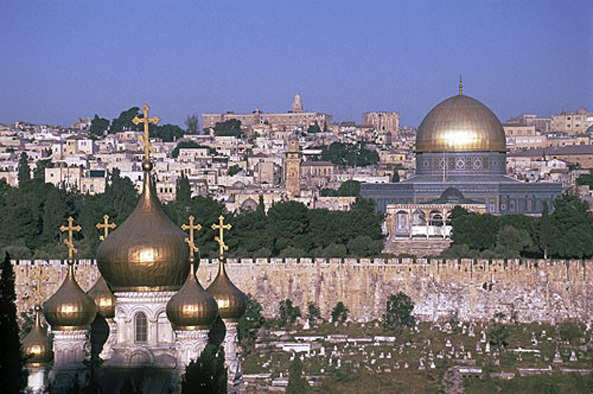 Christian sacred sites in Jerusalem are locations associated with the life and death of Jesus. Most important among these is the Church of the Holy Sepulcher, originally built by Constantine in 335 as a memorial to Christ’s resurrection. It is believed to contain the two most revered sites of Christianity: the hill where Jesus was crucified and the tomb where he was buried and rose from the dead. A stone slab by the doorway is said to be the resting place of Jesus’ body after he was executed. The Via Dolorosa, which winds through the streets of Old Jerusalem and commemorates the path Jesus took on his way to the crucifixion, is an important devotional route for Christians. The Rock of the Ascension, on the Mount of Olives, is believed to bear the footprint of Jesus and is revered by both Christians and Muslims as the place where Jesus ascended to heaven. Christians also recognize the Temple Mount as sacred. The violent struggle for control of Jerusalem has plagued the city for millennia and continues today. Although the conflict is fundamentally a political dispute over territorial rights, it is nevertheless tied deeply to sacred sites. The chief issue, and one of the main obstacles to peace, is control of the Temple Mount. Following the 1967 war, Israel claimed sovereignty over the site but granted civil authority to the Islamic Waqf, a religious trust that has administered the Noble Sanctuary for centuries. Israeli police control security at the site and below, at the Western Wall. Under Muslim control, non-Muslims have been allowed access to the site with the condition that they not pray openly. In September 2000, Ariel Sharon — who was opposition party leader at the time and later served as prime minister from 2001 to 2006 — visited the Temple Mount, an event that sparked the second Palestinian intifada (uprising). This led to the site’s three-year closure to non-Muslims. In August 2003, non-Muslims were again granted limited access to the site, but other conflicts have arisen. The 2007 construction of a new pedestrian walkway to the Temple Mount — replacing one that was damaged by a snowstorm and earthquake in 2004 — sparked protests throughout the Islamic world that the new construction, as well as archeological excavations conducted beforehand, could damage the mosque. In 2006 an Israeli Knesset member proposed building a synagogue on the Temple Mount and King Abdullah II of Jordan announced a competition to design a fifth minaret for the complex, both of which stirred controversy. While it seems there is little international or local consensus on a resolution to Jerusalem’s political problems, it’s clear that the city’s sacred sites, and access to them, will not be truly protected until there is peace in Jerusalem. Over the past decade, the hope for peace has risen and fallen several times. The 2000 Camp David peace talks marked the first direct negotiations over the fate of the city, but talks broke down in part over the issue of control of the Temple Mount. The 2003 Geneva Accord — an unofficial peace proposal created by leaders from both sides of the conflict — received the support of European leaders, former U.N. Secretary General Kofi Annan and members of the U.S. Congress, but failed to gain official support of the Israeli and Palestinian governments. Nevertheless, it is regarded as a standard on which to base future peace negotiations. Unlike the “road map” promoted by the administration of former President George W. Bush, the Geneva Accord tackled the Jerusalem issue, proposing divided control of the city, Palestinian sovereignty over the Temple Mount (with a international security force to ensure access for all faiths), and continued Israeli control over the Western Wall. U.S. President Barack Obama, since taking office in 2009, has attempted to broker a peace deal, leading to the resumption of talks between Israel and Palestine in May 2010. To coincide with the new negotiations, a group of Israelis, Palestinians, Canadians and Americans released a new initiative aimed specifically at helping resolve the conflict over the future of Jerusalem’s Old City. APN. Americans for Peace Now. Armstrong, Karen. Jerusalem: One City, Three Faiths. New York: Alfred A. Knopf, 1993. BBC News. “Q&A: The Geneva accord.” BBC News, November 28, 2003. Blomfeld, Adrian. “Barack Obama threatens to impose peace plan on Middle East.” UK Telegraph, April 30, 2010. Breger, Marshall J., Thomas A. Idinopulos. “Executive Summary.” Jerusalem’s Holy Places and the Peace Process. The Washington Institute for Near East Policy, 1998. Buel, Meredith. “Jerusalem Old City Initiative Releases New Peace Plan.” Voice of America, May 11, 2010. CNN. “Special Report: Mideast, Land of Conflict.” CNN. 2003. Geneva Initiative. Geneva Initiative—Yes to an Agreement. Jewish Voice for Peace. “The Geneva Accords.” Jewish Voice for Peace. Lev, Martin. The Traveler’s Key to Jerusalem: A Guide to the Sacred Places of Jerusalem. New York, Alfred A. Knopf, 1989. U.N. General Assembly. Resolution 181 (II). Future Government of Palestine. A/RES/181(II). November 29, 1947.